Disclosure: This post is sponsored by EQ Bank, and I am being compensated. However, opinions are my own. Please ensure you talk to a financial expert to make sure you are doing what is best for your financial situation. Christmas morning, 2014. I woke up ahead of Wendy and the girls, and headed to the washroom. While brushing my teeth, I looked out of the washroom window into our backyard, hoping for a white Christmas. Well, there was no snow. It was windy. It was raining. 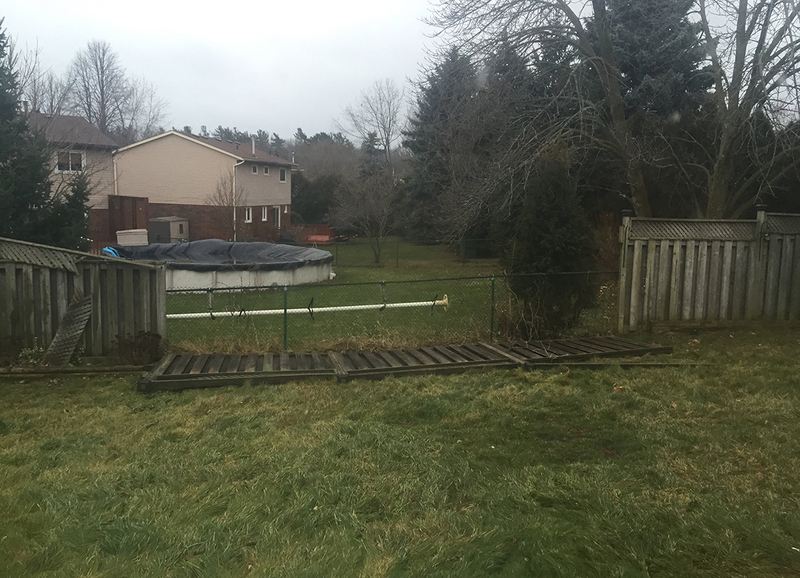 And about 24 feet of our wooden fence had fallen down over night at the rear of our backyard. Someone can try to reassure me that everything will be okay, but I am a worrier. I get it from my Mum. Wendy did her best to let me know that everything will be okay, but it still sat at the back of my mind while I watched the girls open their presents from Santa. It wasn’t until we went into the kitchen to have breakfast that the girls saw the fence down, looked at me, and figured out why I was so quiet. I tend to bottle things up inside. Wendy, on the other hand, was already looking into the cost for a fence replacement and our finances on her phone. She had figured out that we would be okay to cover the costs by the time that we would need to replace the fence. Being Christmas, and the beginning of winter, we would not be able to get anyone to dig holes for fence posts until the ground had thawed. Wendy takes care of the finances in our family. We both pool our money, and each of us knows what we are bringing in and what is going out. Wendy monitors the day-to-day expenses, keeps us on a budget, and pays all of our bills. She also works closely with our financial advisor to ensure we are staying on track with all of our investments. Knowing that dealing with finances is my weak point, Wendy takes the lead. After we finished opening up all of the presents, the girls started going through all of their gifts. Lauren got an Easy Bake Oven and was excited to make some cookies. While she and Rachel were busy making cookies, Wendy and I were sitting at the kitchen table, going over our finances. She pointed out that we had a $5,000 3 year GIC (Guaranteed Investment Certificate) maturing in May. That would work out perfectly, as it would give us enough time to collect a few estimates for the required repairs and to talk to neighbours about the shared sides. Knowing that we had $5000 plus interest due shortly, took some weight off of us. This put us both into a better mood, and we were able to enjoy the rest of our Christmas Day together as a family. Just 4 years earlier, Wendy was heading down to our basement to do the laundry and discovered an inch or so of water on the floor. We went into quick cleanup mode to get all of the water off the ground and all of the furniture, as well as my home office moved. It was Father’s Day weekend. My friend Gemil, a general contractor and mould specialist, discovered a crack in the foundation of our house. He helped us to remove the carpet and some of the damaged drywall. We found black mould behind the drywall and on the floor. When he tested the mould concentration in our basement, it was 10 times the normal rate. Now I am not going to go into the whole process of how we had to quarantine the area, remove everything, fix the basement, or how expensive it was, but I will say we were not ready for that expense. At all. We didn’t have the savings at the time to cover the costs. We didn’t want to go through insurance for fear of our rates going up. In hindsight, we probably should have because this one expense put us in deep debt. Once we were able to bounce back from the basement repair, Wendy and I decided to invest in GICs using a laddering strategy… for “a rainy day”. A laddering strategy is a when you offset the maturity dates of your GICs to maximize your returns. GICs are a type of investment at a financial institution for a set period of time, or term. In exchange for giving the financial institution your money (which they can lend out), they guarantee you will get your money back with a set interest at the end of the maturity date. GICs are a low risk investment, as you are guaranteed a return. There are usually multiple options for term length, with varying levels of interest offered. These calculations assume that you’ve chosen to have interest paid at maturity. Some GICs give you the option to have interest paid annually, but you’d end up with a lower return overall. If you don’t need the money at maturity, reinvest the total return again into a new GIC, and add another rung to your ladder strategy. Or, pay off some debt, go on vacation, or in our case… rebuild your fence. The good thing about GICs is your money is not too far away. Just choose the term, and when the maturity date hits, use the money you invested and the interest you earned to pay for something you need. Or, if you don’t need the money right away, consider reinvesting it in another GIC. At EQ Bank, you can start a GIC with only $100! Note that some GICs are non-redeemable so your money is locked in for the term while others may be cashable. You should always read the terms and conditions before your make a purchase so you know exactly what you’re getting. We used the money from our maturing GIC to fund the repair of our fence. It helped us out a lot, and further solidified the need for us to save our money for a windy and rainy day. Especially if that windy and rainy day happens to be on Christmas Eve. GIC rates shown are in effect as of May 28, 2018 and are subject to change. For GIC terms equal to one year, simple interest is calculated on a per annum basis and paid at maturity. For GIC terms of over one year, interest is calculated on a per annum basis and paid either annually (simple interest) or at maturity (compounded annually). Interest is accrued for the entire GIC term. Non-Redeemable. For more GIC rates and information, visit eqbank.ca.